There are 98 Assisted Living Facilities in the West Mifflin area, with 2 in West Mifflin and 96 nearby. The average cost of assisted living in West Mifflin is $4,100 per month. This is higher than the national median of $3,346. Cheaper nearby regions include McKeesport with an average starting cost of $2,075. To help you with your search, browse the 512 reviews below for assisted living facilities in West Mifflin. On average, consumers rate assisted living in West Mifflin 4.2 out of 5 stars. Better rated regions include Duquesne with an average rating of 5.0 out of 5 stars. Caring.com has helped thousands of families find high-quality senior care. To speak with one of our Family Advisors about assisted living options and costs in West Mifflin, call (855) 863-8283. Located 10 miles southeast of downtown Pittsburgh, West Mifflin is a borough in Alleghany County, Pennsylvania, home to nearly 20,000 residents. Situated along the Monongahela River, this borough is heavily residential, with over one-fifth of its population over the age of 65. Seniors seeking assisted living facilities in West Mifflin should note that these communities are inspected and licensed by the Pennsylvania Department of Human Services and referred to as personal care homes (PCH) rather than assisted living facilities. PCHs throughout West Mifflin are defined by the state as residences that provide supervision, shelter, meals and assistance with personal care tasks to residents. In the greater West Mifflin area, there are 56 PCHs accessible to seniors, with two directly within the borough. The West Mifflin area has few facilities from which to choose in the event of a medical emergency or illness, with the nearest major hospital, Jefferson Hospital, located in Jefferson Hills. The overall cost of living in West Mifflin is 12 percent cheaper than the average cost of living in Pennsylvania. Average grocery and health costs in West Mifflin are cheaper than those average costs in Pennsylvania at large, with housing costs nearly 45 percent cheaper in West Mifflin. Seniors seeking to live in Pennsylvania for assisted living could consider West Mifflin for its relative affordability compared to the rest of the state. A senior has a 1 in 95 chance of being a victim of a crime in West Mifflin, compared to the national average chance of being a victim of a crime of 1 in 35. Certain states throughout the country are considered more retirement-friendly than others because there is no Social Security tax or an additional deduction on retirement income is offered. Pennsylvania is amongst the retirement tax-friendly states and provides seniors in West Mifflin the opportunity to benefit from tax cuts. The public transportation system in West Mifflin, Port Authority of Allegheny County, offers seniors free rides on the bus, light rail or Mon Incline at all times with a valid I.D. The air quality in West Mifflin is considered 18 percent worse than the average air quality across the nation based on an assessment by the EPA and could thus aggravate seniors' respiratory illnesses. Assisted Living costs in West Mifflin start around $4,100 per month on average, while the nationwide average cost of assisted living is $4,000 per month, according to the latest figures from Genworth’s Cost of Care Survey. It’s important to note that assisted living rates in West Mifflin and the surrounding suburbs can vary widely based on factors such as location, the level of care needed, apartment size and the types of amenities offered at each community. 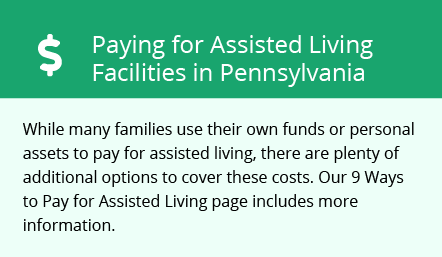 Though the state of Pennsylvania does not offer any specific resources for financial assistance for assisted living (PCH) in West Mifflin, the state's official website suggests enrolling in long-term insurance or paying through personal savings. West Mifflin and the surrounding area are home to numerous government agencies and non-profit organizations offering help for seniors searching for or currently residing in an assisted living community. These organizations can also provide assistance in a number of other eldercare services such as geriatric care management, elder law advice, estate planning, finding home care and health and wellness programs. To see a list of free assisted living resources in West Mifflin, please visit our Assisted Living in Pennsylvania page. West Mifflin-area assisted living communities must adhere to the comprehensive set of state laws and regulations that all assisted living communities in Pennsylvania are required to follow. Visit our Assisted Living in Pennsylvania page for more information about these laws.